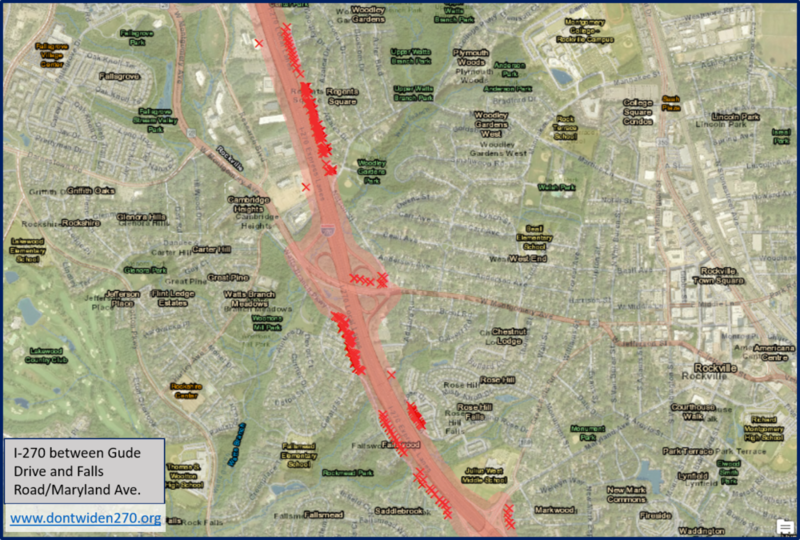 UPDATE (Nov 3, 2018) The Maryland-National Parks and Planning Commission just posted a searchable online map showing the extent of the current rights-of-way (ROW) for I-270 and I-495. Currently, the Maryland Department of Transportation (MDOT) is saying it intends to keep any changes to the roads within the existing ROW. You can use the map to see whether properties would be affected - if MDOT sticks to that promise. If you haven't already, please sign our petition calling on Governor Hogan to direct MDOT to reject any proposal which would involve taking homes or property. But the State has so far refused to provide any concrete answers, even when directly questioned. As the Maryland Transit Opportunities Coalition (MTOC) highlights, State officials refused to answer questions from the Montgomery County Planning Council during a recent briefing. When MTOC asked for the information under the Maryland Public Information Act the State responded that the non-profit citizen group would have to pony up over $6,000 if they wanted a response. That’s a pretty steep price to pay for information generated with taxpayer dollars that could result in taxpayer homes being torn down. But State officials have been keen to avoid providing any specifics about how much the roads might need to be widened. Over the course of eleven public meetings and briefings, the State hasn’t once revealed any concrete information about how much wider the highways would need to be in order to accommodate new toll lanes. I’m no road expert, but it seems like it’d be hard to squeeze four extra lanes into a highway without making it any wider. Hey, if Slater is right, I’ll be thrilled. But until we know for sure, residents need to know who might be affected. 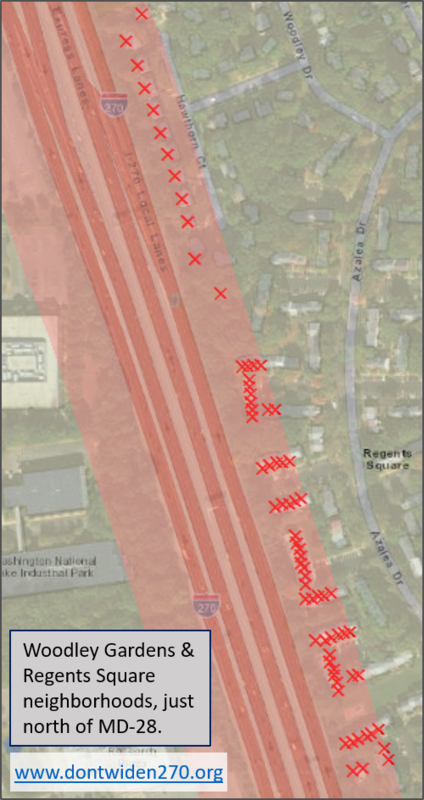 What we do know is that the State’s Managed Lanes study will “ultimately evaluate properties and resources within approximately 300 feet of the existing I-495 and I-270 highway centerline.” Now, that doesn’t mean they are going to pave over everything in that area. But they are studying something, and until the State decides to come forward with concrete information, at least we can get started looking at possible impacts using the 300 feet figure. To that end, I’ve started producing GIS maps along the highway, highlighting the area the State is studying. I’ve done my best to show the buffer extending 300 feet from the centerline of the highway on each side, and what homes and businesses may be in that area. It’s a lot of mapping, so I’m going in segments. The first set I’m posting show I-270 from south of Gude Road to Falls Road/Maryland Avenue. I’ll post more areas and neighborhoods as I get them mapped.